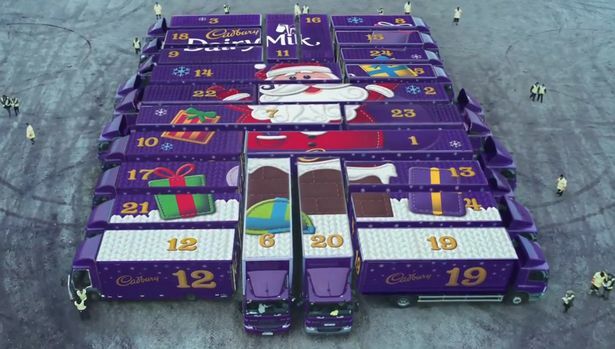 Cadbury’s biggest ever advent calendar. 24 trucks. 24 doors. Opening daily in 24 different locations. Bringing joyful festive surprises to the nation on the countdown to Christmas. The calendar is made up of 24 Cadbury purple lorries, each truck represents a different door of the advent calendar. They will drive to a different location every day in the countdown to Christmas. Set in the warehouse factory, Cadbury's workers prep tonnes of chocolate ready to be shipped off to families in the countdown to Christmas. 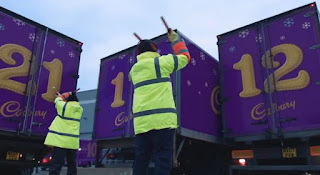 Like elves working in perfect sync, boxes of the famous treat are loaded into huge purple trucks all labelled with big gold numbers from one to twenty-four.